At first, Dragon Ash started out as a rock band, writing and performing music that could have come straight out of Seattle in the early 1990s. But the band's taste started to gravitate toward rap music, and before long, it adopted a sound that has since made them immensely popular. 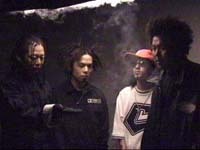 Dragon Ash formed in 1996 by vocalist/guitarist Furuya Kenji. He and high school friend Sakurai Makoto enlisted 29-year-old bass guitarist Baba Ikuzo, who served as mentor to the young Furuya and Sakurai.